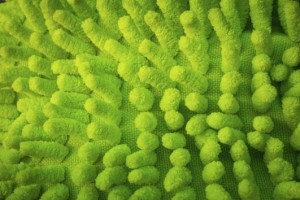 Why Are Microfiber Towels and Mops the Best Solution for Sanitation? We talk a lot about the benefits of microfiber towels and mops on the blog because it truly is one of the most cost-effective ways to improve the sanitation of your facility. You’ve probably even heard us talk about the fact that microfiber is so effective that it can remove 99.6% of all surface contaminants using only water! So why exactly is microfiber so great at providing superior cleaning power for any situation? Read on to find out everything you’ve always wondered about the miracle of microfiber. Microfiber mops and towels are the best way to improve the cleanliness of your facility. Microfiber cleaning cloths and mops are made up of millions of tiny fibers that naturally attract and trap dust, debris, and grime. Whereas traditional cotton towels only contain a few fibers per square inch, microfiber contains thousands and each of these fibers acts as a tiny toothbrush that scrubs a surface clean. Imagine the cleaning power of thousands of toothbrushes and you can begin to understand why microfiber is such a cleaning powerhouse! In addition to the sheer number of fibers, microfiber also produces an adhesive action when exposed to dirt, which is why debris and dust bunnies seem to be magnetically attracted to microfiber cleaning materials. Because of this adhesive action, microfiber cleans up particles that ordinary cleaning cloths would’ve left behind! Detergent is usually used when cleaning because it chemically dislodges dirt and allows you to wipe away contaminants with a cloth. With microfiber cloths, however, no detergent is needed because the fibers effectively dislodge dirt with only a little water and reliably trap it in their curly fibers. When rinsed with hot water, the microfibers uncurl slightly which releases the dirt and allows the cloth to be rinsed clean and used again. Given their superior cleaning abilities and low lifetime cost, microfiber is clearly the best choice for any and all of your sanitation needs. For over forty years, Lord Baltimore has provided reliable, cost-effective microfiber towel and mop rental services throughout Maryland, Washington DC, Northern Virginia, Southern Pennsylvania, and Delaware. To learn more about how microfiber towel and mop rental solutions solutions can benefit your business, please contact Joe Bateman at Lord Baltimore by calling 800-292-1224. This entry was posted on Friday, August 12th, 2016	at 1:29 pm	. You can follow any responses to this entry through the RSS 2.0	feed. Both comments and pings are currently closed.